Growing concern over fuel crisis and global climate change has led to substantial investment and research into alternative fuel sources. In this prospect, photosynthetic organisms have huge potential for biofuels production in a carbon neutral way with net zero carbon footprint by balancing measured amount of carbon released with an equivalent amount sequestered. Fig. 1. Lipid metabolism in algae. As a promising source for production of biodiesel microalgae have drawn immense attention. 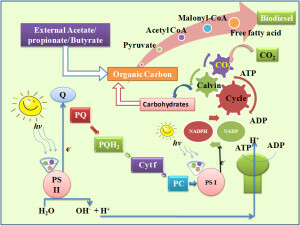 Carbon in the form of organic and inorganic can be assimilated by photosynthetic organism through light harvesting mechanism. This facilitates advantage of photosynthetic organism for remediation of gaseous and liquid waste towards value addition products. Microalgae can accumulate lipids under autotrophic mode but their current photosynthetic efficiencies are not viable for commercial scale production. Low biomass yields, requirement of large surface area and shallow depth for better access of light, are some inherent limitations that persist with autotrophic algal cultivation. In this context, mixotrophic mode of cultivation which can utilize both light and/or organic carbon is receiving considerable attention due to its promise of high biomass and lipid productivities. Mixotrophic cultures have several advantages viz. reduced photo-inhibition, improved growth rates, independence from photosynthesis for its carbon requirements, etc. Carbon from wastewater can be considered as viable feedstock for microalgae cultivation. However, supplementation of complex substrates as carbon sources mandates initial breakdown before they can be utilized for growth and subsequent lipid accumulation. Fermentative products such as short chain fatty acids (SCFA) or volatile fatty acids (VFA) from biohydrogen production can be easily assimilated by microalgae directly for biosynthesis of long chain fatty acids through TGA formation. Bioavailability of acetate and other fatty acids is comparatively superior compared to glucose as their assimilation bypasses complex metabolic pathways (glycolysis) and does not require oxidization to simpler forms of sugar. Acetate gets metabolized by microalgae cells and eventually gets converted to energy via Krebs cycle of mitochondria. Acetyl CoA synthetases and carboxylases are key enzymes responsible for production of lipids in algal metabolism (Fig. 1.). Aim of this research work is to evaluate specific function of selected VFAs (acetate, butyrate and propionate) as carbon source on both growth (GP) and nutrient stress lipogenic phase (NSLP) phases during mixotrophic mode of microalgae cultivation. In GP, lower concentration of SCFA (0.5 g/l) was given for optimal growth of biomass while during NSLP, concentration was increased to 2 g/l for providing stress as well as to supplement carbon on lipid induction. Selected key enzymes involved during SCFA metabolism were also studied by protein profiling. Critical influence of different SCFA as organic carbon source, during GP and NSLP was investigated on biomass and lipid productivity, in mixotrophic fed-batch microalgae cultivation. Nutrient deprivation induced physiological stress stimulated highest lipid productivity with acetate (total/neutral lipids, 35/17) with saturation index of 80.53% by the end of NSLP followed by butyrate (12/7%; 78%). Biomass growth followed order of acetate (2.23 g/l) >butyrate (0.99 g/l) >propionate (0.77 g/l). VFA removal (as COD) was maximum with acetate (87%) followed by butyrate (55.09%) and propionate (10.60%). Palmitic acid was most dominant fatty acid found in fatty acid composition of all variants and butyrate fed system yielded a maximum of 44% palmitic acid. Protein profiling illustrated prominence of acetyl CoA-synthetase activity in acetate system. Acetate utilization was relatively good and microalgae could sustain higher concentrations of acetate thus attaining higher lipid productivity. These low cost SCFAs provide economic routes of biodiesel production from microalgae. Results also provide new insights into strategies targeting enhanced lipid productivity using biorefinery approaches. Lipid metabolism in response to individual short chain fatty acids during mixotrophic mode of microalgal cultivation: Influence on biodiesel saturation and protein profile. Chandra R, Arora S, Rohit MV, Venkata Mohan S.